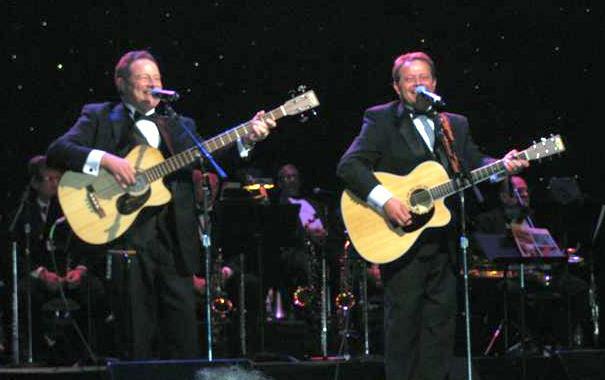 The Otwell Twins are a popular singing duo who appeared on the Lawrence Welk Show from 1977 to 1982. David and Roger first got into music by playing the tuba in the Tulia high school band in Texas which won them music scholarships to Lubbock Christian College as members of the "Good Time Singers." After moving on to West Texas State, Roger found a job at Royal Park in Tulia while David worked at the Cartwheel. They submitted a tape featuring original songs they had wrote to Curt Ramsey and Ted Lennon, associates of Lawrence Welk. After hearing the tape, Welk hired them and they joined the show in October 1977, teaming with the Aldridge Sisters. Today, David lives in Amarillo, TX with his wife Leslie, and Roger lives in Canyon, TX with his wife Millie and their two children.